With a stay at Le Chalet du Mont Vallon Spa Resort in Saint-Martin-de-Belleville, you'll be near ski lifts, within a 15-minute drive of Val Thorens Ski Resort and Bruyeres 1 Gondola. This 4-star hotel is 23.9 mi (38.4 km) from Meribel Ski Resort and 24.4 mi (39.3 km) from Courchevel 1300. Located in Saint-Martin-de-Belleville, this residence is within a 5-minute drive of Cinema Les Bruyeres and Roc des 3 Marches 1 Gondola. 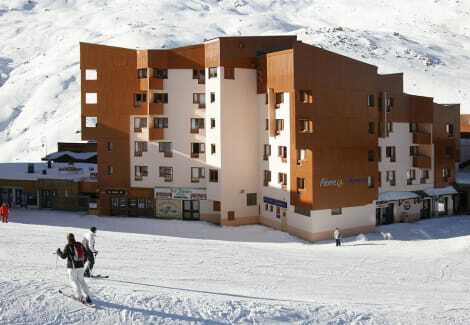 This residence is 5.8 mi (9.3 km) from Val Thorens Ski Resort and 12.1 mi (19.4 km) from Meribel Ski Resort. With a stay at Résidence Pierre & Vacances Les Valmonts in Saint-Martin-de-Belleville, you'll be near ski lifts, within a 10-minute drive of Val Thorens Ski Resort and Bruyeres 1 Gondola. This ski residence is 24.5 mi (39.4 km) from Meribel Ski Resort and 26.2 mi (42.2 km) from Courchevel 1650. Enjoy the convenience of ski-in/ski-out access at this hotel, which also features a sauna and a fitness center. Additional features at this hotel include concierge services, an arcade/game room, and ski storage. Spend the day on the slopes, or enjoy other recreational amenities, which include ski-in/ski-out access. Additional amenities at this residence include complimentary wireless Internet access, ski storage, and a fireplace in the lobby. Grab a bite at La Terrasse, one of the hotel's 2 restaurants, or stay in and take advantage of the room service (during limited hours). Quench your thirst with your favorite drink at the bar/lounge. Buffet breakfasts are available daily from 7:30 AM to 10:30 AM for a fee. With a stay at Langley Hotel Tango in Saint-Martin-de-Belleville, you'll be within a 10-minute drive of Val Thorens Ski Resort and Val Thorens Sports Centre. This ski hotel is 31.9 mi (51.3 km) from Courchevel 1650 and 28.5 mi (45.9 km) from Meribel Ski Resort. Enjoy the convenience of ski-in/ski-out access at this residence, which also features an indoor pool. lastminute.com has a fantastic range of hotels in Les Menuires, with everything from cheap hotels to luxurious five star accommodation available. We like to live up to our last minute name so remember you can book any one of our excellent Les Menuires hotels up until midnight and stay the same night.